Answer: I don’t prefer the Dutch chest. This Q&A was repeated at least 20 times on Friday and Saturday during the Lie-Nielsen Hand Tool Event in Cincinnati, Ohio. I had brought the Dutch chest so people could examine it and get a feel for how it works. I’d also brought an English-style chest, which was filled with Lost Art Press books. So here is a list of the advantages and disadvantages of each style of chest. With an overall size of 27” wide x 13” deep x 26” high, the Dutch chest fits on the backseat of almost any vehicle and can be strapped in with a seat belt. I can easily lift and carry the chest myself. The full-size English chest is 40” wide x 24” deep x 26” high. It takes two people to move it, and you have to have a truck, utility vehicle or station wagon to transport it. My smaller traveling English tool chest can be handled (barely) by one person and fits in many cars. But it is still not as easy to move as the Dutch. The Dutch chest takes me about 16 hours of shop time to build (including the paint). It has only two dovetailed corners. The rest of the joinery is dados, tongue-and-groove, glue and screws. It can be built with dimensional pine and requires only one panel glue-up (for the lid). The English chest takes me about three times as long to build because there is so much more wood and everything is dovetailed and nailed. It’s a major project that requires a lot of wood and considerable time to complete. Though I haven’t tested either chest into the ground, past experience tells me that dovetails will last longer than screws. The English chest really is designed to last forever. The bottom bits are designed to be replaced when they rot out. The orientation of the joints on the skirts are designed to hold the chest together even if the glue fails. The Dutch chest is solid enough, but it’s not designed to take the same level of punishment as the English chest. If the bottom rots out, I’ve got to rebuild the chest. If the screws rust and the glue fails, lots of things are going to come loose. The Dutch chest isn’t ugly – several people at the Lie-Nielsen show said they preferred the looks of the Dutch chest. But to my eye, the English chest is beautiful. I like the shadow lines created by the skirts and raised-panel lid. I’ve experimented with adding more visual interest to the Dutch chest with some success, but it still looks like a grain bin to me. While the English chest holds more, the Dutch chest holds enough and makes it easier to move your stuff around. Getting to all the tools in the Dutch chest is easy if you put the chest on a sawbench. You don’t have to prop up the English chest, and its lid is another working surface in the shop. So the bottom line is that I’m glad I have the Dutch chest because I am on the road teaching for about 13 weeks out of the year. And the Dutch chest makes travel easy. But when I come home, I’m always happy to see my English chest with its open lid, waiting to get back to work. P.S. 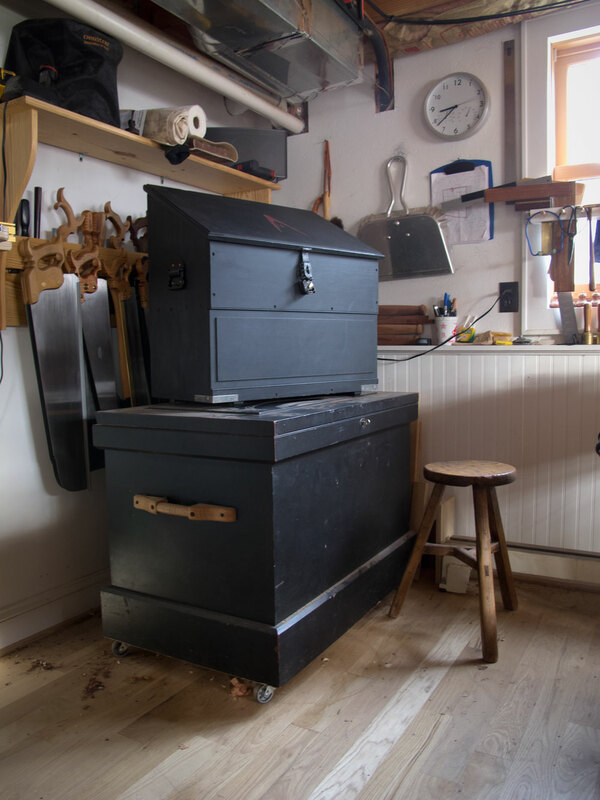 Megan Fitzpatrick, the editor of Popular Woodworking Magazine, says my story on Dutch tool chests should be in the October 2013 issue of the magazine. There are no promises in the magazine world, but that’s the word today. This entry was posted in The Anarchist's Tool Chest. Bookmark the permalink. Sorry to pester you, but is there any estimate on when the DVD’s for the plywood/screws English chest and the easier to build bench will be coming out? I don’t know what the release schedule is. F+W is making final edits on the tool chest DVD (I’m the one holding up that show). We haven’t shot the bench one yet. The tool chest DVD should be available around mid-May. October publish would be just about perfect. I have a few things lined up but would really like to make the Dutch chest before end of year. Also, one quick question: what is a “woobie”? OK I have one of those just didn’t know what it was called. The only thing I remember from Mr Mom was the scene where he comes to the door wielding the chain saw. Maybe it’s time to create a FAQ section. In the long run, it might free up some work time. I’m sure not all shops are like mine, a single car garage, and when I’m working on a project “things” tend to get stacked where ever there is a flat surface. The Dutch chest solves this problem with the sloped top and you will be able to get to the tools without “un-stacking” the top. I’m going with your smaller English chest for the September class in Port Townsend. Ha. I almost asked you that because by Saturday because I figured you had already been asked that question a zillion times. I was neat seeing it up front before forking out my cash. Why does the Dutch chest need to be plugged in after being used? I really enjoyed the event, bought some stuff, found Midwest woodworking (closed) and stopped at Ceaser Creek flea market to pick up some rust, but the highlight was discovering Chris’ double secret, tibetan book of woodworking mastery technique; smelling the shavings of Australian blackwood. Who made the ebony infill i see there if you dont mind me asking? It’s actually blackwood. 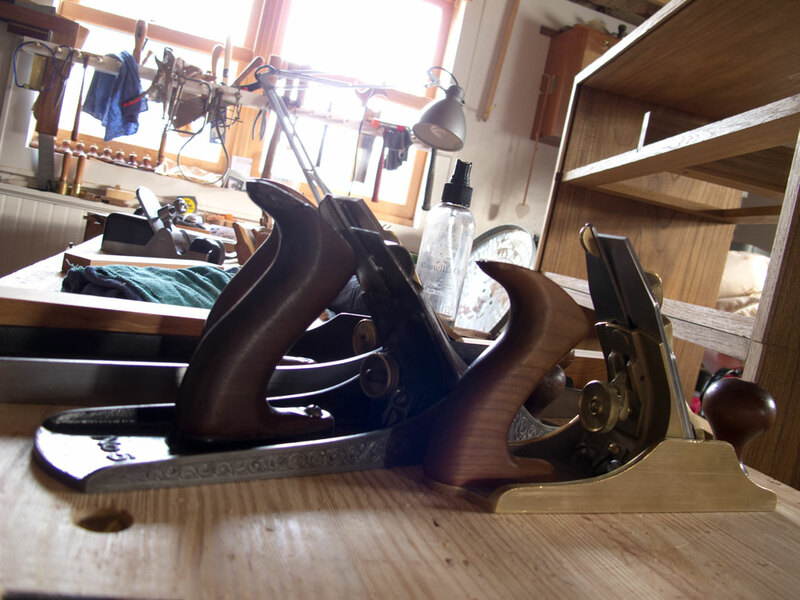 It was made by Raney Nelson of Daed Toolworks. It was nice seeing it in person. You did forget that the english chest is much more comfortable to sit on. Hi have you put metal reinforcing brackets on the two front corners? I did put a couple on there – more for looks than anything. Those corners are dovetailed, but they do take a lot of abuse. October?? nuts to that, I’m building mine this week. Keep in mind that the October issue mails to subscribers in early August (no, I can’t explain the wackiness).